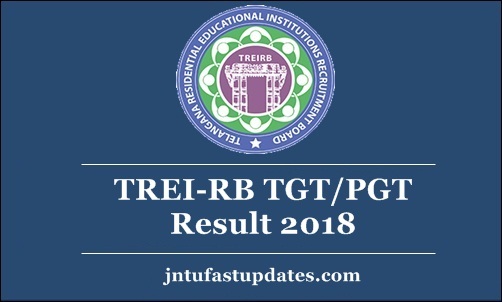 TS Gurukulam Results 2018 For TGT PGT Paper 1,2 & 3 :Telangana Residential Educational Institutions Recruitment Board (TREI-RB) conducted the TGT (Trained Graduate Teacher) & Post Graduate Teacher (PGT) examination for Paper I, Paper II, and Paper III on various dates in September and October months. Many of the hopefuls have attended the TREI-EB Gurukulam TGT and PGT written test as per the scheduled dates. The examinations conducted on 28th September, 29th September, 1st October, 3rd October, 8th October for Paper II and Paper III and 11th, 12th, 13th October, 22nd, 23rd, 24th October. The Telangana Gurukulam TGT PGT written test has been conducted in many examination centers across the state. The organization conducted the TGT PGT Examination for various subjects Physical Sciences, Telugu, Sanskrit, English, Mathematics, Science, and various other subjects. Aspirants applied for various courses have competed for the examination. The answer keys for the respective examination have released by the organization after the completion of the exams. Now, the hopefuls who are keen to check TREI-EB TGT PGT Result 2018 can wait for few days and stay checking the official website, treirb.telangana.gov.in to check more updates. Telangana Tribal Welfare Residential Educational Institutions Society (TTWREIS), Gurukulam Telangana released the notification for 2932 Trained Graduate Teacher (TGT) and Postgraduate Teacher (PGT) posts. A massive number of interested and eligible aspirants have applied for the announced posts. The TTWREIS has organized the written test as per the scheduled dates. The examination was conducted in many examination centres across the Telangana state. Almost all the applicants have appeared for the examination as per the scheduled dates. The TREI-RB is going to announce the TGT and PGT result soon on its official website, treirb.telangana.gov.in. The result will be released in 1st week of November. Hence the aspirants who have competed for Telangana TGT And PGT posts can expect their results in the month of november. Keep checking the TREI-EB Official portal for more updates. The cutoff marks for TGT and PGT exams will be announced by the organization. Competitors scoring the cutoff marks/qualifying marks in the test will be forwarded to the next rounds. The cutoff marks will be based on various factors. Along with the result, the organization will also release the cutoff marks. Candidates can wait for more updates regarding the results and cutoff marks. I got 107 in tgt maths tet 95 BC d women is any chance to get job? Cut of marks list …telme sir any chance……. I am from zone 6, Bc b,i got in pgt maths 102, Tgt maths 99.75..